The train ride from Porto to the Douro takes ages (almost three hours; at just €5.80 it's spectacularly cheap), and for most of the way it's a sluggish crawl through the suburbs of Porto. But two hours out, approaching Régua, the scenery suddenly changes, and you find yourself in the spectacularly beautiful Douro. The train is actually a good way to see the Douro for the first time: the track runs alongside the river most of the way, with great views if you sit on the right hand side of the carriage. My destination was Pinhão, in the heart if the Douro, where I was picked up by Jorge Serôdio Borges, who took me to see his own project, Pintas. Pintas is an exciting new wine. It’s the project of husband and wife team Jorge Serôdio Borges (Dirk Niepoort’s number two, making wine Niepoort and Passadouro [note added February 2004: Jorge has now left Niepoort]) and Sandra Tavares (winemaker at Quinta do Vale D. Maria in the Douro, and also Chocopalha, her family’s property in Estramadura). 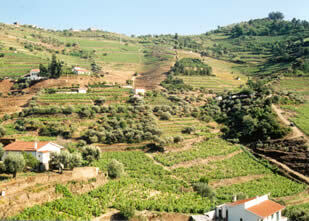 The grapes are sourced from 2 hectares of old vines, containing some 25-30 different varieties. Barrels of Pintas filling the lagares n The grapes are then crushed, destemmed and fermented in lagares, before being transferred to barrel for malolactic fermentation. A mixture of new (70%) and one year (30%) oak is used (the second-use barrels come from Quinta do Vale D. Maria, where Sandra is the winemaker). 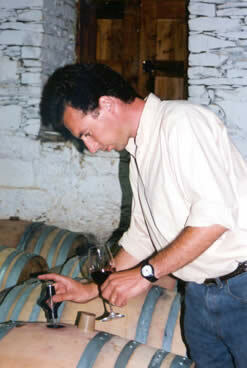 Jorge and Sandra have made a considerable investment in barrels: new ones typically cost €500, and one-year old barrels are about half this. 6000 bottles will be produced from this inaugural vintage; bottling is likely to take place in January. Jorge patiently talked me through samples from several of the barrels. I’m publishing all my notes for the sake of completeness here, but there are further notes on a cask sample blend of Pintas included in the write up of the big tasting at Chanceilleros. 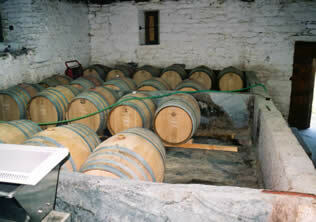 The usual caveats about barrel-tasting apply. I was really impressed by what Jorge and Sandra are doing here. These are deeply impressive wines with lots of Douro character in a polished, rich, ripe style. It will be fascinating to see how the final wine turns out. My prediction is that Pintas will become one of the real stars of the Douro, and I felt privileged to have the chance to try it this early on in its life. As an aside, Pintas is also the name of Jorge and Sandra’s ebullient puppy. I’m not good on dogs, so I can’t tell you the breed, but it’s a reasonably cute brown-spots-on-white hunting dog, whose father I met later at Quinta do Crasto. Barrel 1 new François Frères Vosges oak. This is a big, black brooding monster of a wine. Rich, intense nose with some spicy oak showing. Massive concentration with very ripe fruit and firm tannins. Wonderful spicy complexity: taut with herbal richness. Barrel 2 new François Frères Allier oak, soft toast. More acid and spice here. Overall a little smoother, but still very tannic. Barrel 3 medium toast new Allier oak. Much more toasty oak on the nose with a pronounced roasted character. Barrel 4 new medium toast from Tonnellière Billon. This one shows firm tannins and a slightly muted nose, with some roasted character. Barrel 5 Seguin Moreau Allier medium toast, new. Quite tight and firmly tannic. Barrel 6 One-year old barrel. This wine is more noticeably herbal, with a slightly lighter structure. Very expressive and a good blending component. Barrel 7 One-year old from Cadus. Really impressive with a lovely herbal complexity.